I’m loving my roast vegetables these days, and the addition of parmesan not only sharpened the flavor, but also made for an irresistible silky texture. 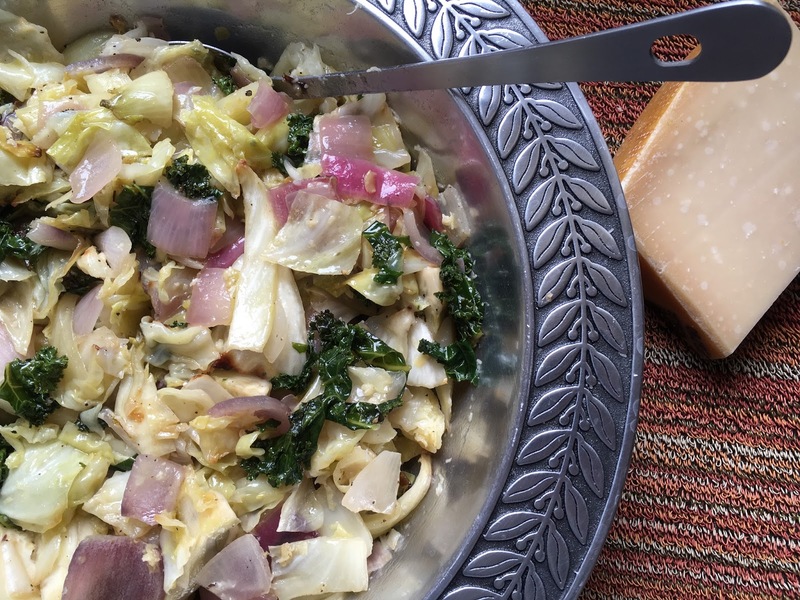 Preheat your oven to 450 and chop a half a head of cabbage, two red onions, and a fennel bulb into medium sized pieces. Toss together with enough olive oil to barely coat the vegetables along with a healthy sprinkling of kosher salt and pepper. Transfer to a large shallow pan and throw in the oven. After thirty minutes, turn the oven down to 350 and stir in two large handfuls of coarsely chopped kale and four to six minced garlic cloves. Roast for another twenty minutes, then remove from the oven and scrape everything into a large bowl. Toss with a cup of grated parmesan, and salt and pepper to taste. If you’re not planning on serving it right away, use an ovenproof bowl for easy reheating.